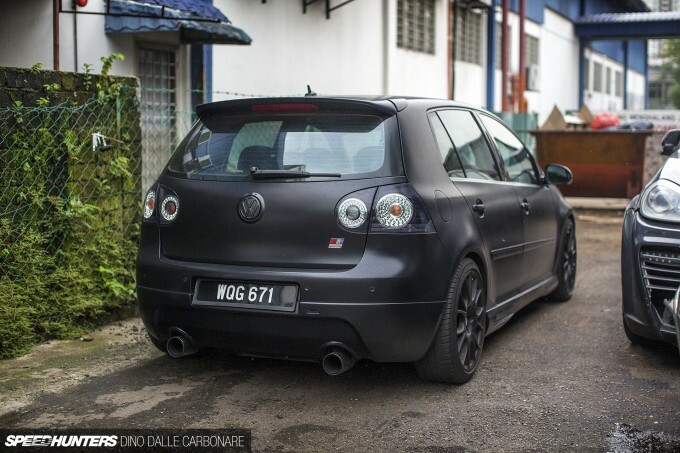 Like many countries around the world, Malaysia has seen a shift in car culture over the last decade. Once upon a time it was all about JDM tuning and styling, but once the Japanese manufacturers stopped production of affordable sportscars and the Germans stepped in with exciting cars, the enthusiast landscape changed. It’s what’s been happening in Japan of late, so on my recent visit to Kuala Lumpur it didn’t surprise me to see it happening there too. 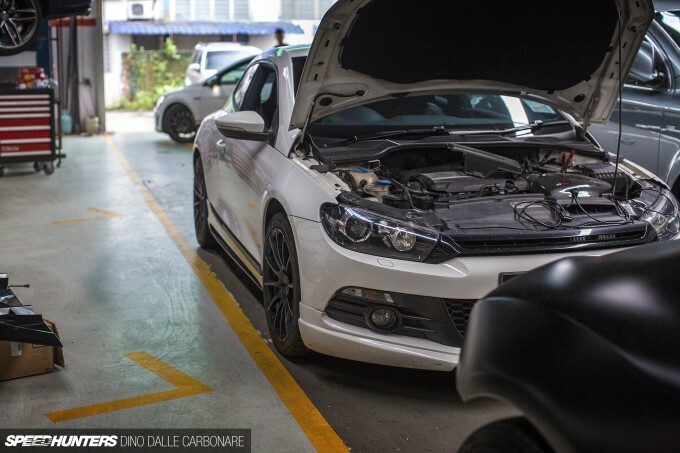 What did surprise me, however, was the different way in which European car tuning is approached – or at least the way one of the biggest outfits in KL, Euro Werks, does it. 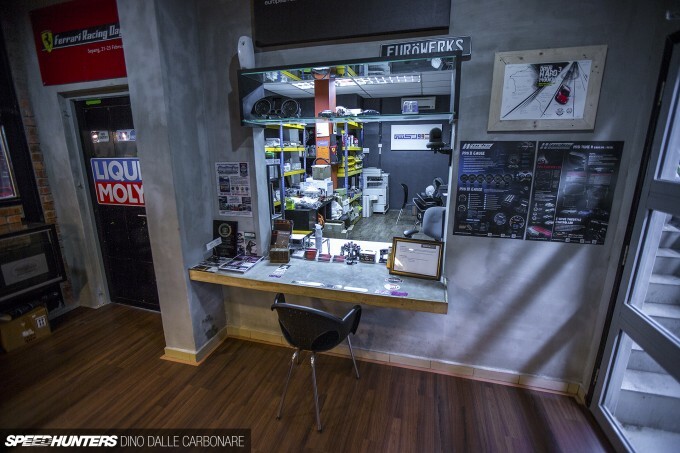 While VWs and Audis continue to grow in popularity in Japan, the average tuning shop hasn’t changed, meaning that tiny operations are still the norm. 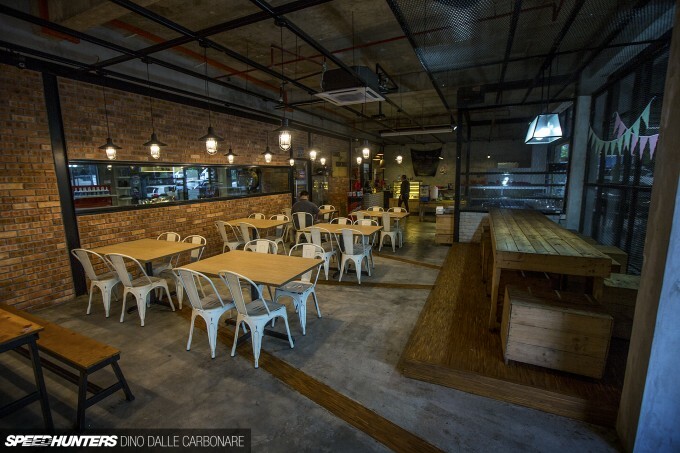 But Euro Werks impressed me straight off the bat due to its size and the fact that it combines a place for car enthusiast to chill and hang out. And the more time I spend in Malaysia, the more I’ve realised just how good the country’s car guys are at hanging out! 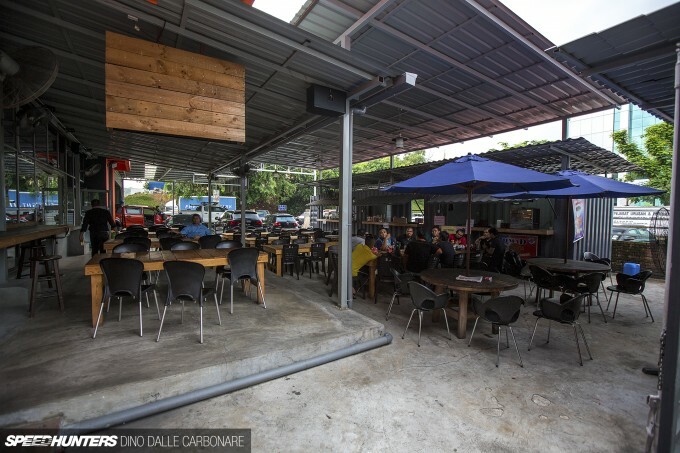 As soon as you arrive at Euro Werks you’re greeted by rows of tables and seats both inside and out, not to mention a variety of booths selling food and drink. I was liking this already. 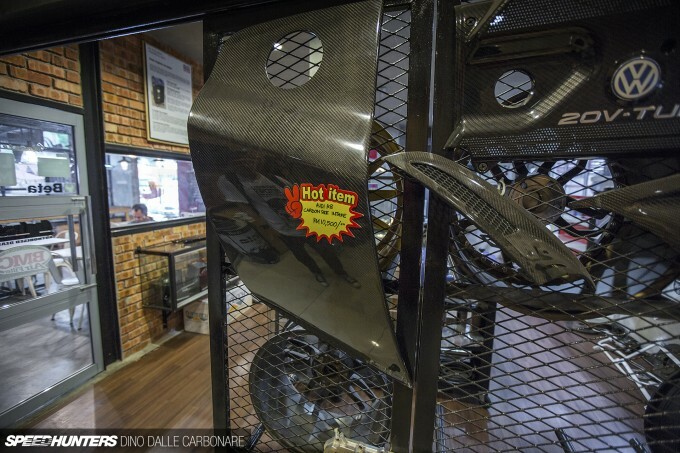 Once I stepped into the actual shop I found yet more space in which customers can relax in air-conditioned comfort, while being surrounded by countless displays of tuning parts. 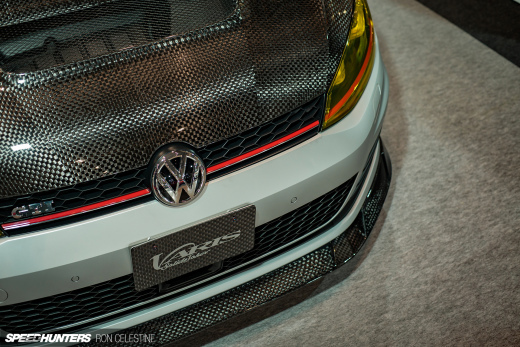 Carbon, of course, is the material that everyone wants. 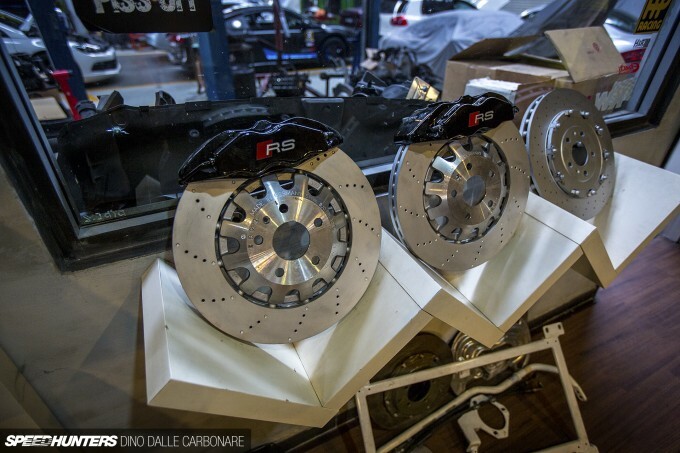 And it doesn’t matter if it’s for your Audi R8 or a more attainable model, like a Golf or Scirocco GTI. 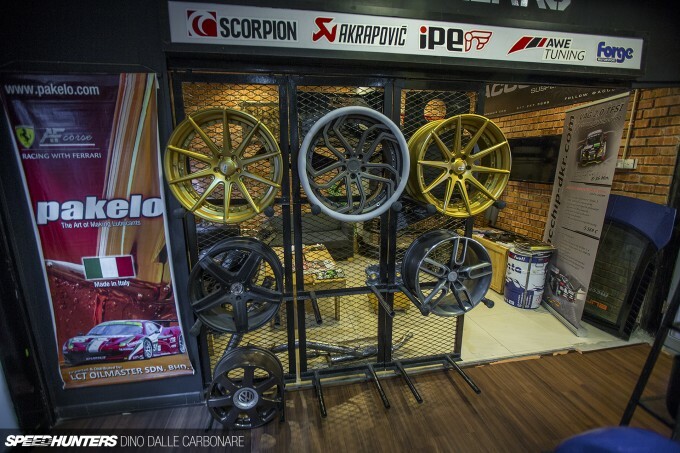 And what would a reputable shop be without a decent selection of wheels. 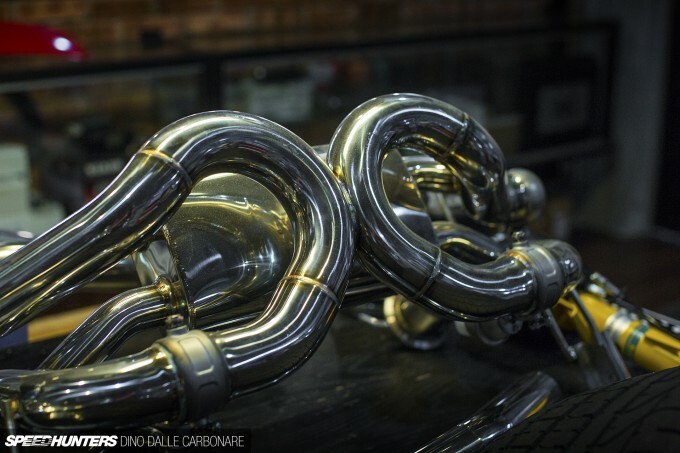 After getting your car to sit just right on a set of fashionable rims, then comes the tough job of choosing an appropriate exhaust system to enhance the sounds coming from the engine. Looking at the selection of exotic systems for high-end cars like the R8, I couldn’t help but think back to Project Drop Top and wonder what I can do to get it to sing a little sweeter. Modern day performance cars are wonderful machines, offering a beautifully relaxed ride most of the time, and then when you need it, a sharp and raw demeanor at the flick of a switch. But most of them just aren’t loud enough. It was tough moving from the cool office to the incredibly hot workshop, but after being teased with so many performance parts I just had to see some cars. The first car I checked out was this satin black R8. I had seen the car days prior at the Art Of Speed show, and I was glad it still had its rear bumper removed so that I could take another look at its lovely AMS twin turbo kit. 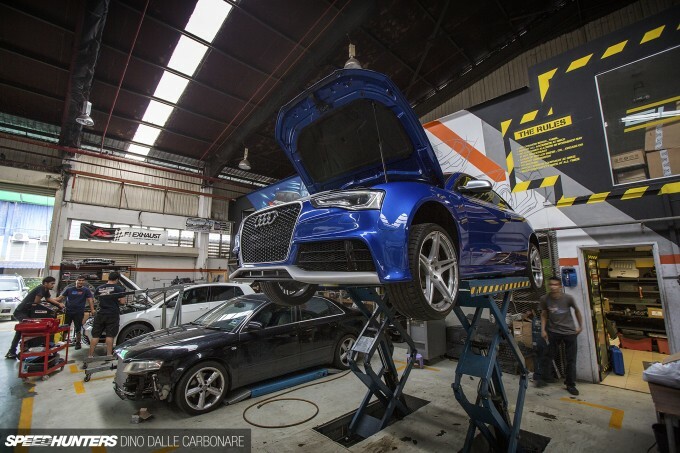 The Audi was back at Euro Werks for final setup after it was quickly finished up to meet the show’s deadline. This is one seriously well-engineered kit that even features horizontally-mounted heat exchangers fitted at the back of the car. 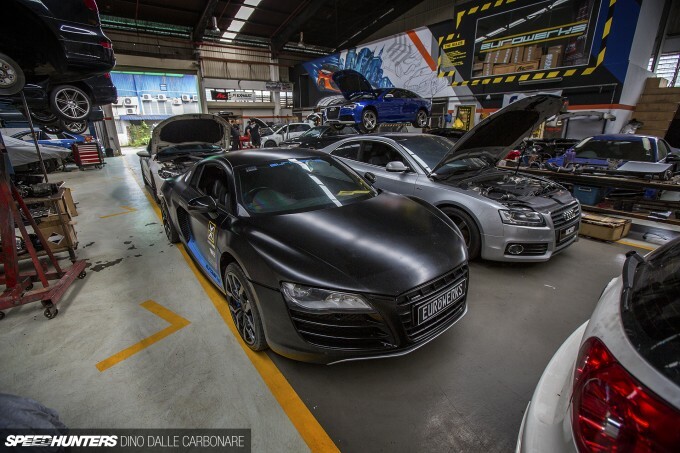 900hp in an R8 – that should be fun! Not too far away there was another R8 in for some work, perhaps having a new exhaust system fitted as there was a stock one sitting next to it. As you can see, the majority of work Euro Werks does is for Audis and VWs. Many of the owners simply want to experience the full potential of the force-fed engines that most of these cars come with. Exhaust and intake upgrades are a great start, but nothing will get you gains like a simple little ECU re-flash via the OBD-II port. 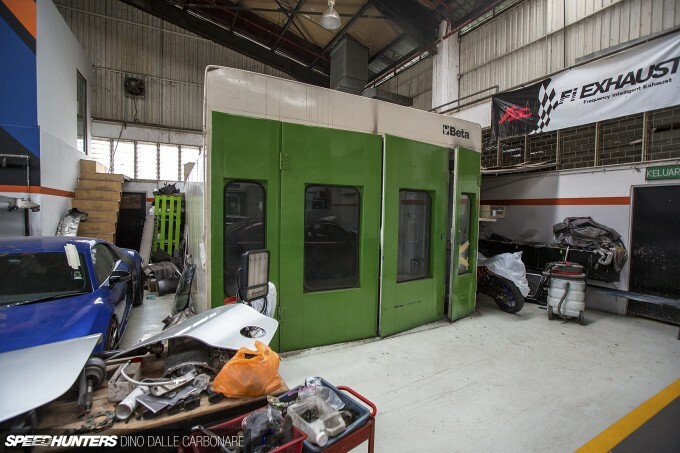 At the far corner of the workshop I spotted a proper paint booth – a rare sight to see back home in Japan. Most Japanese shops just use a section of their garage that’s cornered-off with draped nylon sheets. 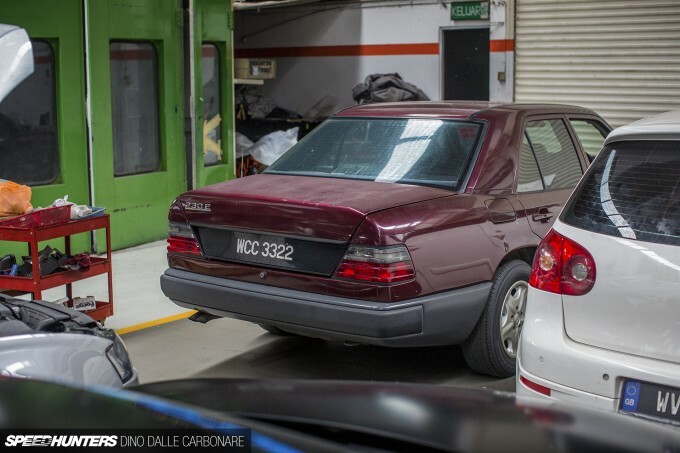 W124? You will see these cars everywhere and anywhere as they are indestructible! This Scirocco was in for an ECU re-flash, which will have its 2.0-litre engine pushing out substantially more oomph than stock. I’m still surprised that VW doesn’t sell these in the US market, as they seem to be so popular in many countries that I visit. One step up from the GTI is the R; VW taking the 2.0L turbo engine and mating to an AWD layout – something the Japanese were once so good at. That’s one great pair right there. 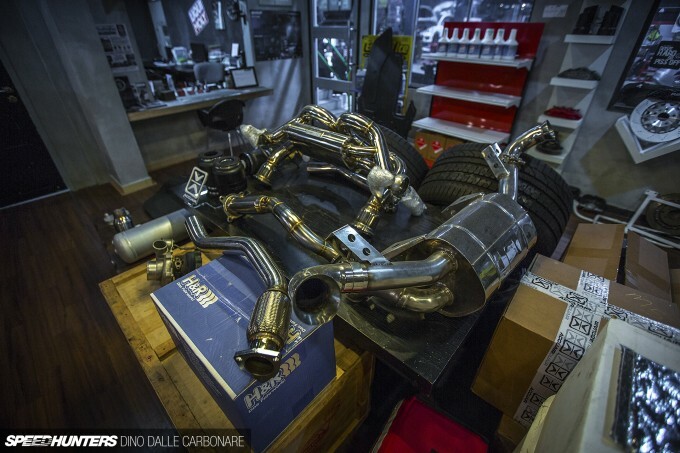 Check out the IS F like stepped exhausts on the Mk6 Golf. There were so many different generations of Golfs sitting around, and all in different states of tune. The black-on-black look is something you just can’t go wrong with – at least that’s what I’ve been telling myself in deciding on a look for Project Drop Top. 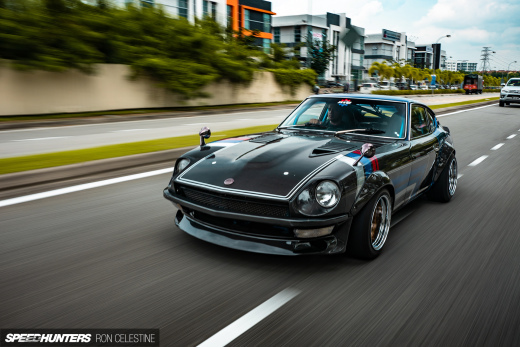 The JDM-like overfender craze that we are experiencing right now thanks to companies like Rocket Bunny and Liberty Walk is obviously spreading. Miura-san did tell me that he designed a couple of Golf kits for Japanese VW tuners a few years ago, but I’ve only seen a handful of examples running widened fenders. I liked the look of this one, but I had to wonder if those rear tyres would rub on the bumper section of the wheel arch under hard compression. 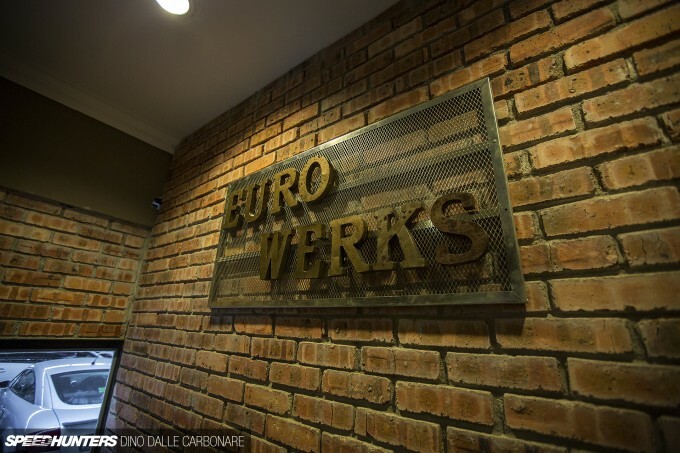 Euro Werks also has a dedicated detailing shop right next to the main building, and it looked extremely busy at the time of my visit. 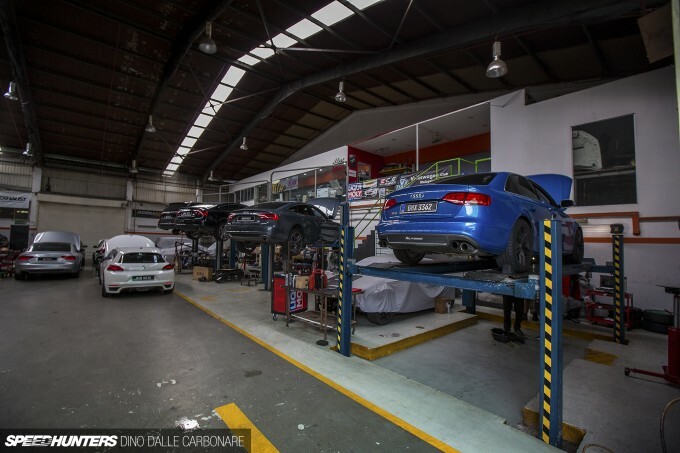 Despite car owners getting unfairly overtaxed when purchasing imported cars or anything luxurious, there is obviously still enough people in Malaysia that put up with it. 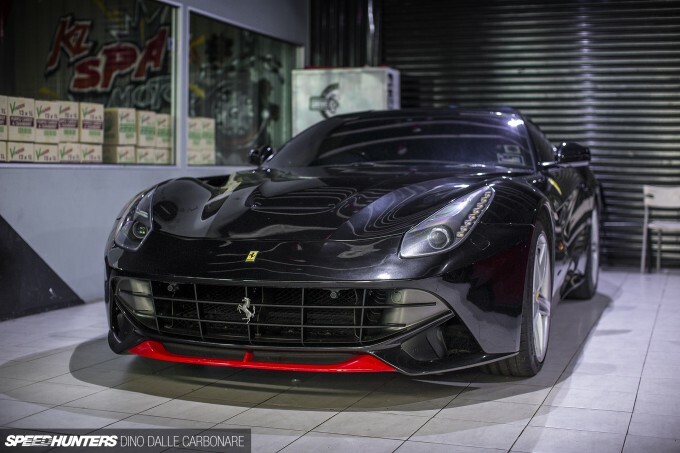 This F12 was looking rather imposing and it’s one of probably three Ferraris I saw while out there. Next to it was this BMW 5 Series – a car that initially fooled me by its vented front fenders. 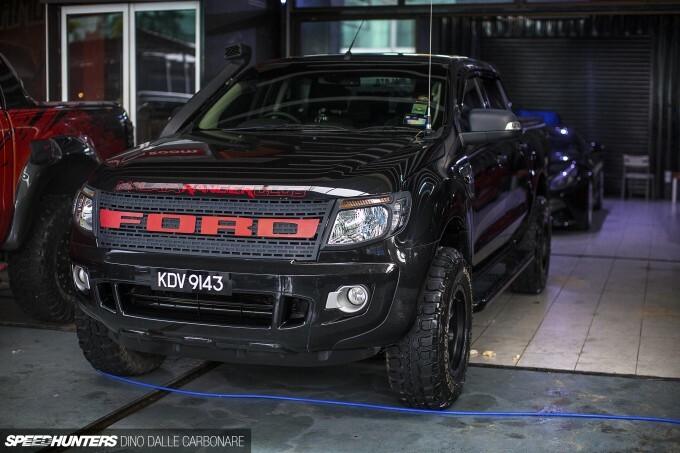 Again, due to how much people get stung when buying expensive cars in Malaysia, it’s become quite popular to make your vehicle look like it’s of a higher spec than it really is. So no, this is no M5, and 80 per cent of the AMG-badged Benzes are not C63s. It’s not confined to Euros either – I saw plenty of Mugen RR Civics that were really just dressed-up FD2s. One vehicle that makes a lot of sense if you live out of the city is a pickup, and there are quite a few on the streets of Kuala Lumpur. 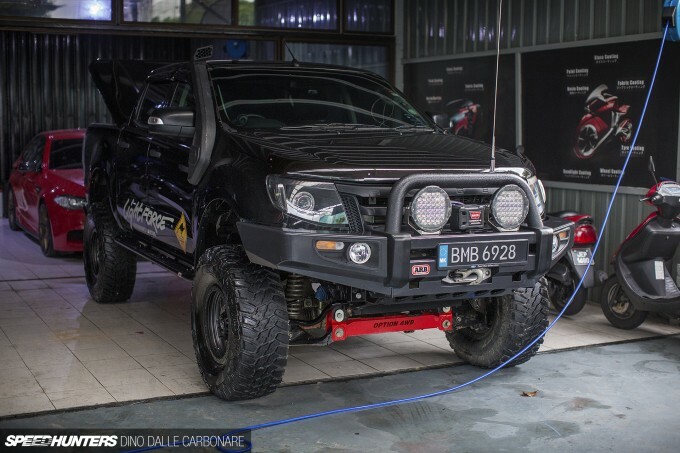 Most are heavily customised with off-road tyres, lift kits and snorkels. Ford has a big slice of new pick-up sales, especially with its Ranger looking like a baby version of the Raptor. If I lived in Malaysia I’d definitely be picking one of these things up! 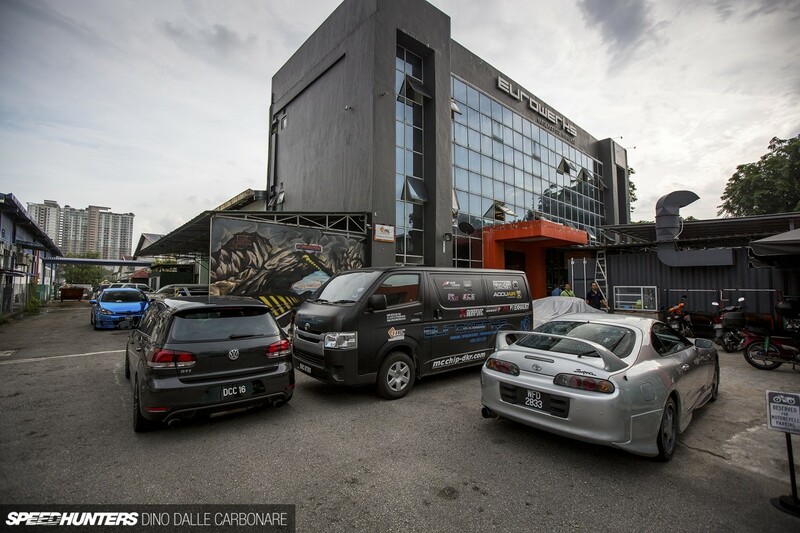 I’d like to extend a big thanks to the guys at Euro Werks for allowing me to have a nose around their massive establishment and check out yet another facet of Malaysian car culture. Those trucks have "Jurassic Park" written all over them. Especially that blue one. I love the concept of having a place to hang out while your car gets worked on. While I love the quality of work the shop that I frequent puts out, the "waiting area" leaves a lot to be desired. A couple of couches and a TV looping old episodes of Top Gear isn't very inviting. Especially when you have to stay and wait for your car because you live 40 miles away and don't have anywhere else to wait. A place to hang out, eat or drink something would bring in extra revenue for the business and make customers feel comfortable. As a friend of someone getting a car worked on, you wouldn't mind going to hang out with them while they wait cause it's a place where you would want to go. 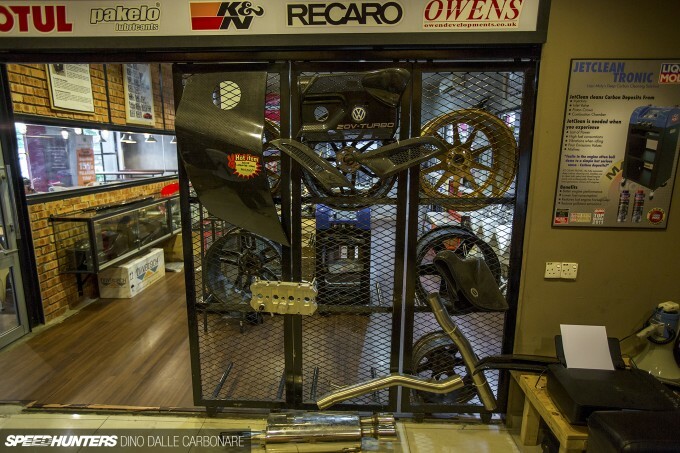 This is all what I would want from a shop while I have my car there on top of the quality service I get. ok... I want a Ranger. Never thought I would ever say that. The One Otaku Most shops don't have the space to do something like that. 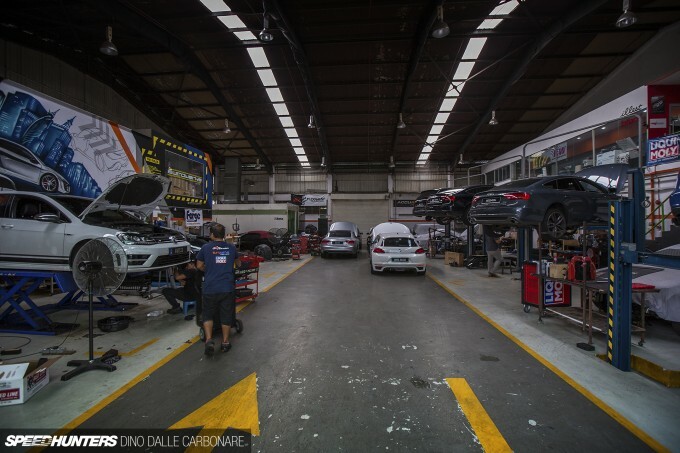 Partly because its a space that could store more parts, another customer's car, etc, also because here in the US you would need cooks/servers/Health inspections/cleaning crew and everything that comes with a restaurant....and they are in the car business. another reason would be the need. As a concept i like it but in reality, it's gonna be rare. Wildcardfox Rangers have been ugly for more than a decade, probably why. 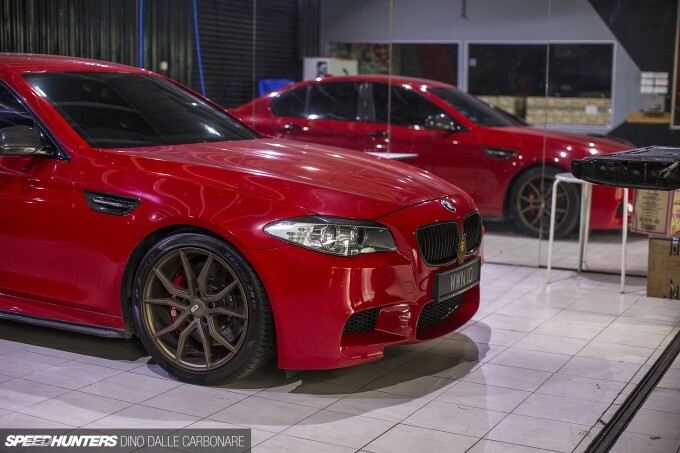 Malaysia do have European car culture during the JDM car craze 20 years ago but mostly are Italians, such as the Alfas and the Fiats, you even have a higher chance of seeing an Alfa GTA on the road compared to a BMW 2002. now seems that the Germans have taken over the road. Yah that's kinda what I was implying as to the previous models. D1RGE The One Otaku Too true, I'm lucky if I have space for customers cars in the first place. Good idea for sure and it's cool, but only practicable for a lucky few. Ice Age ditto. with the floods brought about by the rains, i'm sure they've gotten to give it a proper wading once in a while. 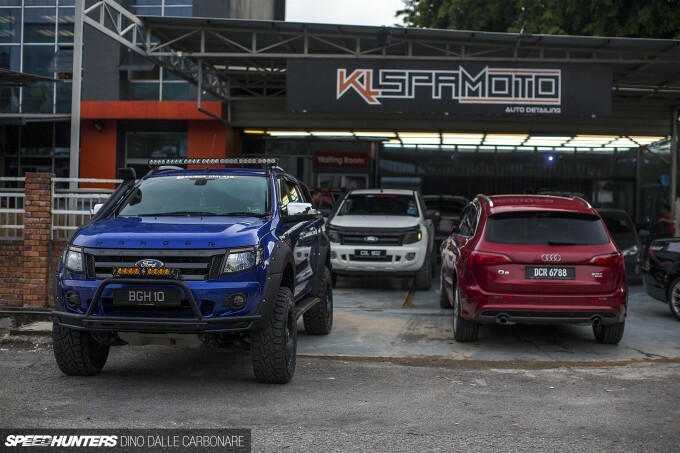 I love those Rangers more than the Audis and Ferraris featured in the article. So pissed that Ford stopped making them and didn't sell the the world market model here in the States. Oh well, I've still got an old one to cherish. Hi..where is ur loction? Open today? Thanks..
Audi A4 (B7) 2.0 TURBO - YEAR 2006.